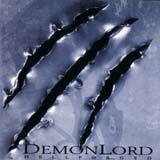 Demonlord is a Hungarian power metal band, with Hellforged being my first exposure to the band. The band formed in 1997, and this is the band's third full length release. Demonlord plays power metal in the vein of Running Wild, Iron Savior, Grave Digger, and Iron Fire. The Running Wild influence is perhaps the most obvious throughout the album. Even though the power metal genre is very crowded these days, there is an occasional "new" band to my ears that rises above the crowd to earn substantial playing time in my stereo. I'm not a stickler for originality (for which Demonlord would score few points), but I only ask for something good. While not mind blowing, Hellforged is an excellent slab of power metal that deserves a place in any power metal fan's collection. The album opens with the catchy and thunderous Cheap Salvation. This track gives you a very good idea of what Demonlord is all about. Galloping riffs and speedy, double bass drumming pave the way for the band's sound, with only a few departures. Vocalist Balázs Jurásek possesses a gruffy, but powerful mid range voice, and he sings with passion for his music. You'll never hear him screeching for the high octaves, so if like power metal vocalists from the bands I mentioned above (particularly Running Wild and Iron Fire), you'll surely enjoy Demonlord. I like how he shows a sinister side of his voice during Murder One and Morphing Into Real. At any rate, I appreciate Jurásek's to combine power, melody, and a touch of gruffiness into his voice; it makes for an enjoyable listen. As I touched upon earlier, the band's recipe stays fairly true to the Germanic school of power metal. Without a doubt, they do very well by this very long and illustrious list of bands in the genre. With that, it's pretty easy for me to describe the band's sound for you. Galloping riffs and a very steady and forceful rhythm section form the foundation of Demonlord's sound. At the same time, the riffs are addictive as hell, and you'll get hooked on a new one with each listen to this album. This is the same feeling I used to get from Running Wild, prior to their change in sound over the last few releases. The melodic quality of the songs themselves is ever present, but not necessarily with sing along choruses in every song, which are the bread and butter of many bands out there. The riff structures, combined with Jurásek's sense of melody behind the mic makes it pretty easy to drive these songs into your head. Backing vocals are used extensively to accentuate the melodies throughout the verses. Songs like Cheap Salvation, Return to Nowhere, and the title track are good examples of songs that rely a bit more on anthemic chorus lines, but also deliver the goods with the rest of the song as far as strong riffing and songwriting. The band deviates a bit from their path with Kill the Lord and Murder One. Both are more slanted toward ballsy hard rock ala Accept rather than the power metal style that dominates the rest of the album. Despite its title, Kill the Lord is a tongue in check, fun sounding track that actually comes off very well. Like Kill the Lord, Murder One sees the band take a break from the full out power metal for a moment, and I do hear a bit of Motorhead here, particularly with the sinister tone that permeates the track. Again, this track comes off very well, and it's nice to hear a band mix in something different, particularly in a genre that often yields very one dimensional albums. Find a Goal is the ballad of the album. Not too sappy, there is actually some very nice soloing and guitar work to be heard here. Vocally, Jurásek reminds me of Chris Boltendahl of Grave Digger using clean vocals during a Grave Digger ballad. It would be easy for this track to get buried under all the thunderous tracks on this album, but this is one ballad that will get a reprieve from my skip button. Hellforged has me sold on Demonlord. Fortunately, my ignorance about the existence of this band ends with the arrival of their third album. This is certainly an album that rises above the huge flood of mediocre power metal bands out there. I wouldn't call this album a classic, but it is better than a majority of what's out there today. 2006 is shaping up to be a very good year for me musically, and Hellforged is another bright spot. Highly recommended for fans of the Germanic school of power metal.